Maultaschen are a Swabian specialty food, consisting of an outer layer of pasta dough with a filling traditionally made of minced meat, spinach, bread crumbs and onions and flavored with various spices. 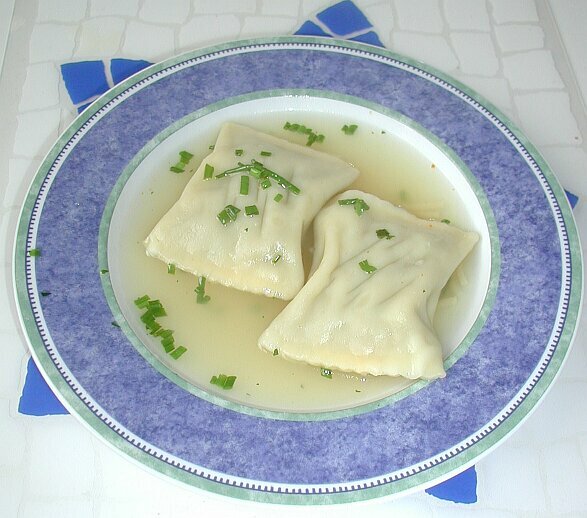 Left: Maultaschen in a clear vegetable soup. Similar in appearance to Italian ravioli, Maultaschen are usually larger, however, each Maultasche being about 8-12 cm (3-5 inches) across. Maultaschen are traditionally eaten either geröstet (cut into slices and fried in a pan with onions and scrambled eggs) or in der Brühe (simmered in vegetable broth), or geschmälzt (dressed with butter and onions), usually with potato salad. While home-made Maultaschen are often prepared according to the family's traditional recipe, Maultaschen are also available in stores. There, they are offered with a wide variety of fillings, ranging from traditional ones to salmon or vegetarian versions. Maultaschen are rumored to have been invented by monks of the Maulbronn monastery to conceal the fact that they were eating meat during lent. The monks hid the meat inside of the Maultaschen, believing that God couldn't see it that way.